The 52nd Student Government Association (SGA) convened on Monday night to hear the club participation audit committee’s final report. SGA also discussed a bill proposed by SGA BBA Liason Geoffrey Tseng (19B) and BBA Council President Jay Krishnaswamy (16Ox, 19B) on amending the Student Activities Fee (SAF) split to decrease funding for College Council (CC) and increase funding for BBA Council and Emory Student Nurses Association (ESNA). The audit committee’s report recommended that Goizueta Business School students’ contribution to CC be reduced from 14 percent to three percent and Nursing school students’ contribution to CC be reduced from 10 percent to four percent. The recommendation was based on the findings that 53 percent of students participating in clubs funded by BBA Council were enrolled in the College. The report recommended raising BBA Council’s funding from students in Goizueta from 34 percent to 45 percent and Nursing students’ contributions to their own divisional council from 68 percent to 74 percent. Krishnaswamy and Tseng proposed adjusting how the SAF is distributed among divisional councils based on the audit findings and the committee’s findings. They proposed the bill at this meeting because there are only a limited number of SGA meetings left in the semester and they hope to pass the bill before Dec. 15. CC Treasurer Hithardi Duggireddy (20C) expressed concern that the bill to change the fee split was rushed. “The [SAF] split should be more robust. It should be able to withstand at least for some time because we can’t change this every year or every semester. It just seems rushed,” Duggireddy said. CC Freshman Representative Chandler Smith (22C) told the Wheel after the SGA meeting that he felt CC was not involved enough in the audit process, making the proposal unfair. Smith also expressed concern that both the bill and the audit committee are headed by high-ranking members of the BBA Council. Tseng, who serves on the committee and sponsored the bill that formed the committee, serves on BBA Council. Representatives from each of the divisional councils are also on the committee. Huey O’Neil (21C), who oversaw the audit in a non-voting role, disputed Smith’s characterizations. O’Neil wrote in a Nov. 28 email to the Wheel that Smith previously voted for the methodology used to compile the committee’s recommendations. “Chandler has been present at the vast majority of audit meetings and played an integral role in the execution of the audit,” O’Neil wrote. Krishnaswamy and CC co-Chief of Staff Jacob Hicks (18Ox, 20C) argued about whether SGA could discuss the bill without notifying all undergraduate students, because changing the SAF split is an “issue of significance” and the SGA Constitution requires SGA to notify all undergraduate students of such proposals before discussing them. 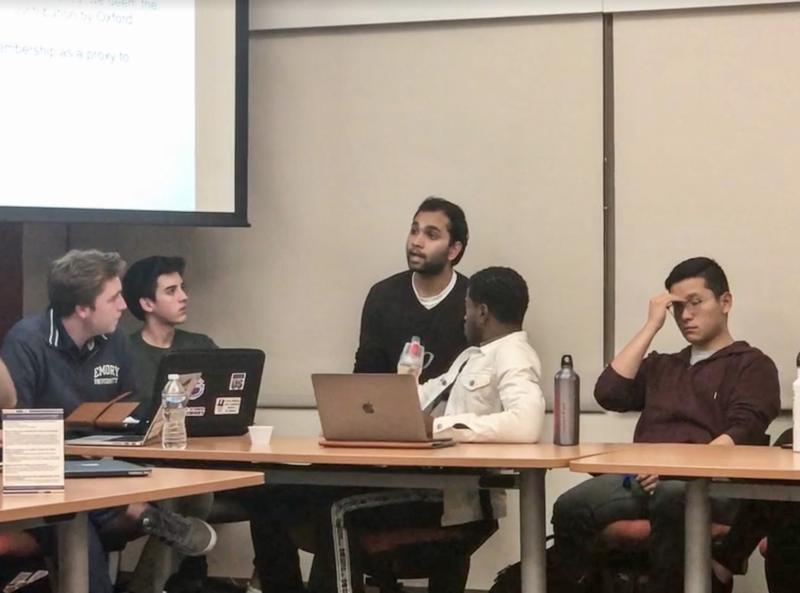 Krishnaswamy urged SGA to move the bill to the daily calendar for next week so they could meet the SGA Finance Code’s Dec. 15 deadline to amend the fee split for the 2020-2021 academic year, while Hicks said that doing so without sending proper communication to the student body would be unconstitutional. “It is unconstitutional to vote on this without telling the student body,” Hicks said. Krishnaswamy acknowledged the clause, but noted that SGA had already violated that rule earlier this year. Krishnaswamy added that, previously, SGA justified sending the legislative agenda sent before the weekly meetings to members of SGA and the Wheel as sufficient communication to the undergraduate student body. He specifically cited SGA voting on SGA Vice President of Communications Tiffany Haas’s (19C) bill to create a new executive position earlier this year as a violation of the SGA Constitution without notifying all undergraduates first. “The communication that was sent out that counted was essentially sending out the agenda, so if you are going to apply the same rule, you have got to apply it both ways,” said Krishnaswamy. Haas responded that she had the authority to appoint a temporary deputy and that the bill that SGA voted on hasn’t fully passed yet. “I have constitutional authority to establish my own assistant and I did so via a bill and I haven’t done a constitutional amendment yet, we are going to get to that in the spring,” Haas said. The legislature did not resolve the question about the constitutionality of the proceedings on Monday night. Editor’s Note (11/28/18 at 11:55 a.m.): A previous version of this article incorrectly said Tseng served as chair of the audit committee. The Wheel removed the article from its website at 11:20 a.m. following notification of the error. The revised article corrects the error and includes a response from O’Neil regarding Smith’s role on the audit committee.